Forget what you’ve heard about SEO procedures for just a moment. Search engine optimization is not dead, dying, or going anywhere. Like a fine wine, SEO is evolving, maturing, and becoming significantly more intelligent. Fundamentally, you simply cannot rank for a given keyword or group of related keywords by simply getting online magazines and newspapers to link to your website. Will it help later on in the game? Absolutely. However, the first principle of SEO (at least in my opinion) is Relevancy, not Popularity, which is a close second. 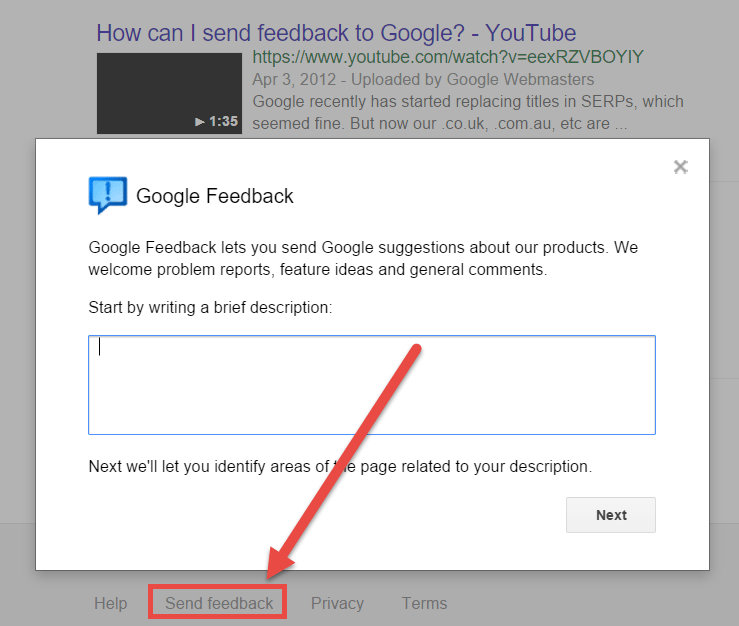 On every Google SERP (Search Engine Results Page) there is an option to click “Send Feeback” and submit feedback via a pop-up form. In this 3-part tutorial, I’m going to walk you through several page-level SEO focal points you can give attention to that may help specific pages on your website perform better. By better, I mean receive more long-tail search engine traffic, earn organic links, and invoke the natural desire to share pieces of (or the entire) web page. If you’re following along in Google Search Console, we’re going to be exploring and monitoring the section labeled Search Traffic > Search Queries and will be using the Top Pages tab. Five years ago, I would have suggested doing keyword research first when optimizing a web page. However, it’s too easy to turn great content into crap if you’re thinking about search engines and not your target demographic. If you’re in the pool cleaning business, working on a page that will likely be focused on “pool cleaning service” (regardless of what terms we’ll actually use later), take an hour and survey your customers. Ask them what they like about your service. Ask them what they dislike about a previous service they might have used. Ask them what they think you can improve on or what they’d like to see included or not included in their routine pool cleaning. Be sure to ask the obvious question: “What words or phrases would you use to describe us if a friend or family member inquired about us?” Now we’re getting into some real SEO, not keywords that the AdWords Keyword Planner suggests you to spend your money on. Ooops, did I type that out loud? Not enough data? Try Amazon Mechanical Turk for more suggestions, but be sure to start your survey title with “Pool Owners Only Please”. Tabulate what you get back and sort your list by the most common answers. Let’s say your top 3 things were: always on time, low pricing, and macho unattached pool technicians. Now you know what sells; now you know how to deliver exactly what your audience is looking for. Take those answers and go on a shopping trip at Fiverr.com for custom illustrations and graphics that fit the width of your page, and are so well designed that your visitors will immediately recognize their desired outcome the moment they hit the page. If you’re designer is talented enough, visitors may even decide to click your “Pin It” or “Share on Facebook” button, which begins to satisfy search engine Popularity ranking signals. You do have those buttons show up over your images don’t you? Below is a list of elements that will play a crucial role in the visitor’s decision to stay, read more, convert into a lead, or (not good) return to the search results and cost you a point in your search engine user history profile. What, you didn’t know they were tracking user returns? Testimonials – go crazy with this one, let that page scroll baby! But most importantly, keep it simple, with one very easy to find call-to-action button, form and/or phone number. Don’t make them look for it, make them keep thinking about clicking it while they’re reading your page. Checkout Neil Patel’s awesome example of a High Converting Landing Page here, at least for inspiration. Will you stay on for the journey? If you’re optimizing a webpage while following along, please make a note of the page (if it already exists) and all of the data that appears in Google Search Console under Search Queries > Top Pages tab, for the last 90 days. This is your baseline report. You’ll measure your success 90 days from the day you feel your page is well-optimized to see if you successfully generated more visits from more keywords than you had 90 days prior.